One of the brightest talks of the event was Mark Mulligan‘s, co-founder and analyst at Midia Consulting, who emphasized how technology has an essential role to modify the relationship between society and music: from the birth of radio to Spotify today, reactions have been many and very different, but music has survived, enlarging its reach. Using Mulligan’s words: “Not fighting the technology is the best we can do”. In his speech filled with graphics and data, he settled the four main phases on digital music: first, piracy; second, download; third, streaming; and fourth, the rise of curated and listen services, which is the one where we are placed now. Asserting that there is still a long way to go through, for instance on the streaming path or the fans engagement, he pointed out that “artists still need to find their pop-corn”, as they haven’t found yet the alternative way of getting the expected revenues from their work. 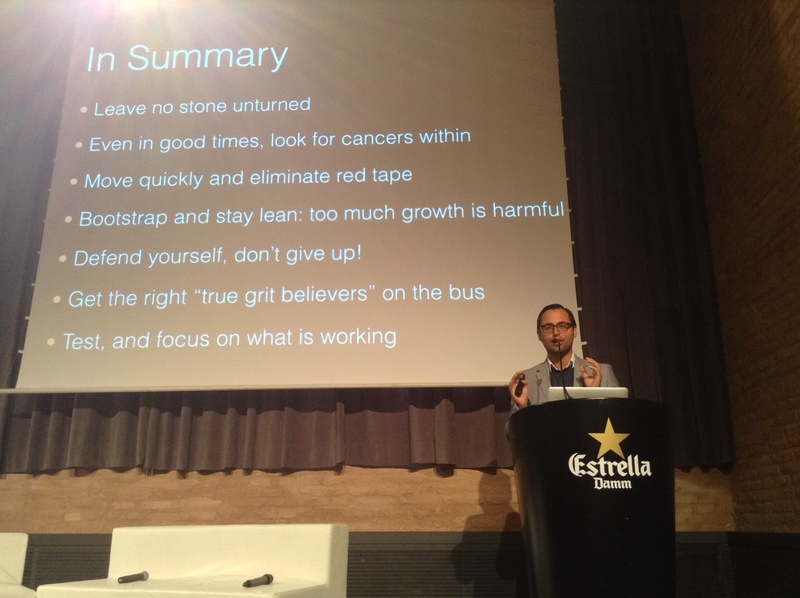 On the other hand, Sam Tarantino from Grooveshark gave some important lessons for music tech startups, based on his own experience founding one of the more successful on-line music platforms of the last years. He explained with extreme sincerity the birth of Grooveshark and its incandescent raise from 2008 to 2011, followed by the crash of the company on 2012. “Music biz is tough”, he confessed, but despite of this he decided not to give up. From this decision and subsequent recovering of the company, he pulled out some essential lessons he shared with the audience, knocking down prejudices and proposing a new way of understanding this industry. Just to mention some of the most encouraging: “Leave no stone unturned”, “Minimize burocracy, let your team solve the problems”, “Bootstrap and stay lean”. Big Data and its impact on music industry was something fundamental to be discussed in such a reunion of insightful experts, and to do so they gathered some of the leading figures of this area: Mark Mulligan (moderator), Chris Carey (Media Insight Consulting), Fred Bolza (Sony Music Entertainment) and Joe Perez Orive (Ticketmaster). 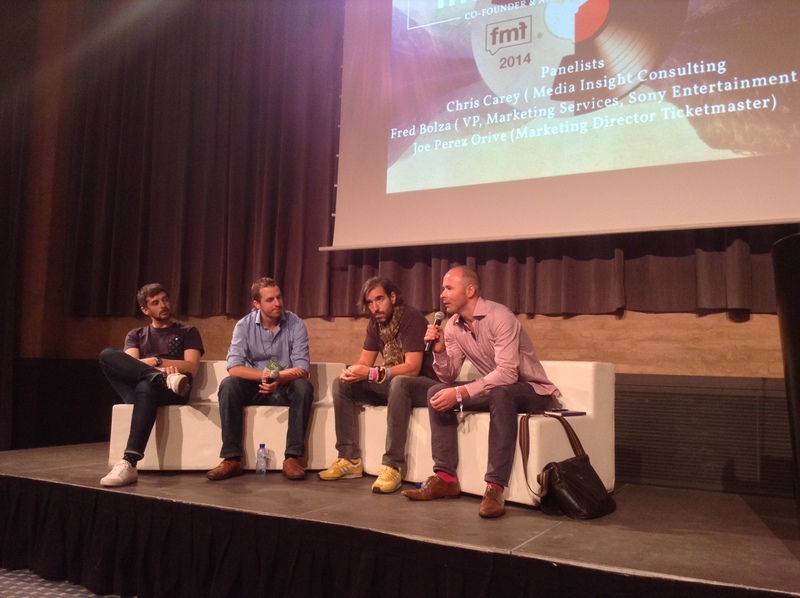 This panel discussed how music companies approach search, insights and big data. 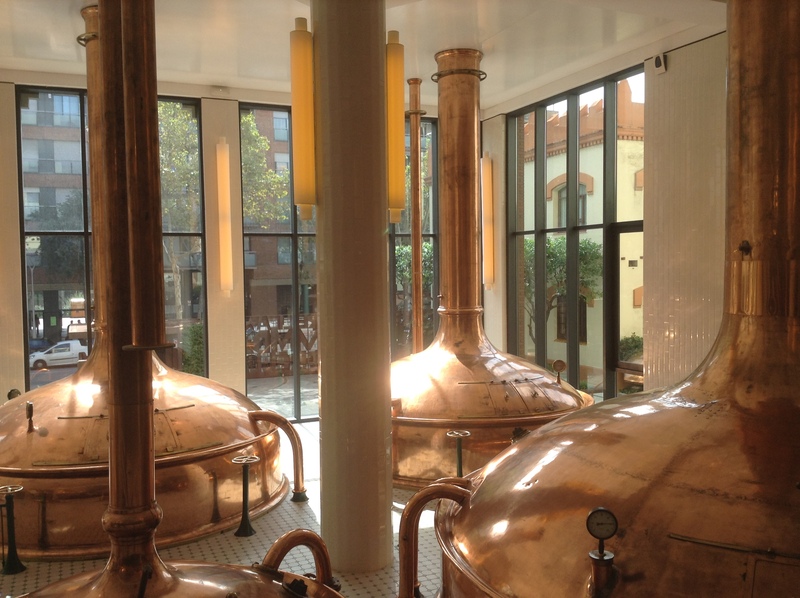 All of the participants agreed that this is one of the main challenges of the industry today. As Chris Carey put it, companies need to learn how to face this, hence they need to be taught in the first place. According to Fred Bolza, there’s still an old fashion of understanding data, as music companies are focused on watching charts and information that just explain what has already happened, but not the data which can tell what is about to come. The way of reading and understanding data is essential for the new models of music biz, but we can’t pass over the difficulties of getting valuable information: as Joe Perez clarified, people feels uncomfortable in front of an excessive request of personal details. This brings us to the question finally asked by Mulligan, “What big thing we still don’t know about fans?”, to be answered by Chris Carey: what we still don’t know about them is why, in a time when music is more beloved than ever, people are not willing to pay for it. To know more about Big Data in the music industry, read our interview with Chris Carey here. From left to right: Jeff Bolza, Chris Carey, Joe Perez Orive and Mark Mulligan. The new digital models in music business are turning upside-down not only the work of professionals in the industry, but of artists themselves. During his talk, Benji Rogers, founder and CEO of PledgeMusic, showed the deep change on the whole development of creation. The direct-to-fan model has proved extremely successful, and this impact goes beyond the pure way of selling music, but of the way of making music too. As Benji Rogers put it, there are three frontiers: releasing the music, touring the music, and making the album. As you see, this is not the conventional order we usually give to music creation but, as PledgeMusic has demonstrated, this very much might be the normal way of developing any musical work. Firstly, the artist needs to engage their fans exposing his / her story, establishing a relationship where context is as important as music, and then from the bond between artist and audience the album is funded and launched. A revolutionary path that is giving back the emotional, personal involvement of music to the audience and providing many new opportunities to artists. Following this same emotional path, Hessel van Oorschot from Tribe of Noise invited songwriter and performer Jeff Campbell on stage to perform one of his songs. Van Oorschot reminded that artists like Campbell were the reason why he was in this business. At the end of the day, music only exists because of artists. Both of them analyzed and discussed the direct-to-fan model, and emphasized the importance of an open perspective on rights management: exclusivity has no true sense in digital environment, therefore we are heading to an scenario where artists hold their rights, being represented by multiple agents or platforms. In the end, digital stats will tell the true story. 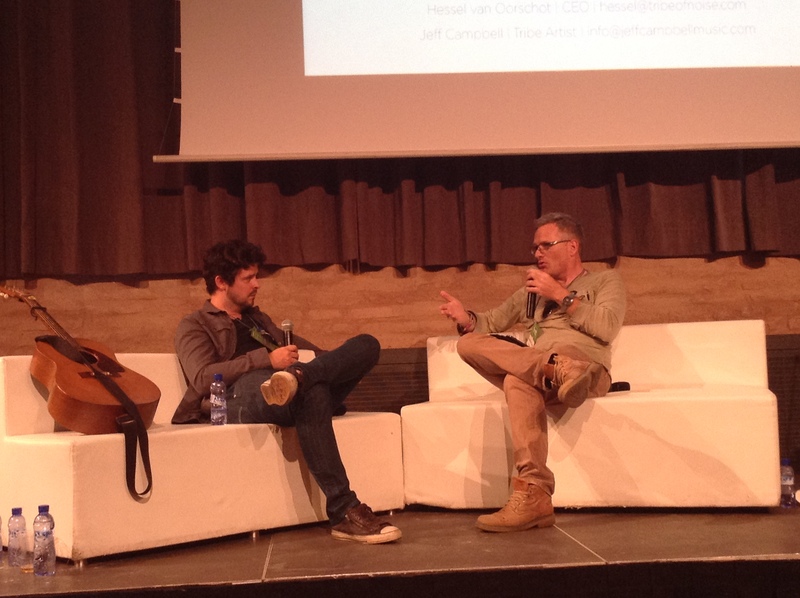 Jeff Campbell (left) and Hessel van Oorschot (right) discussing about music and business. 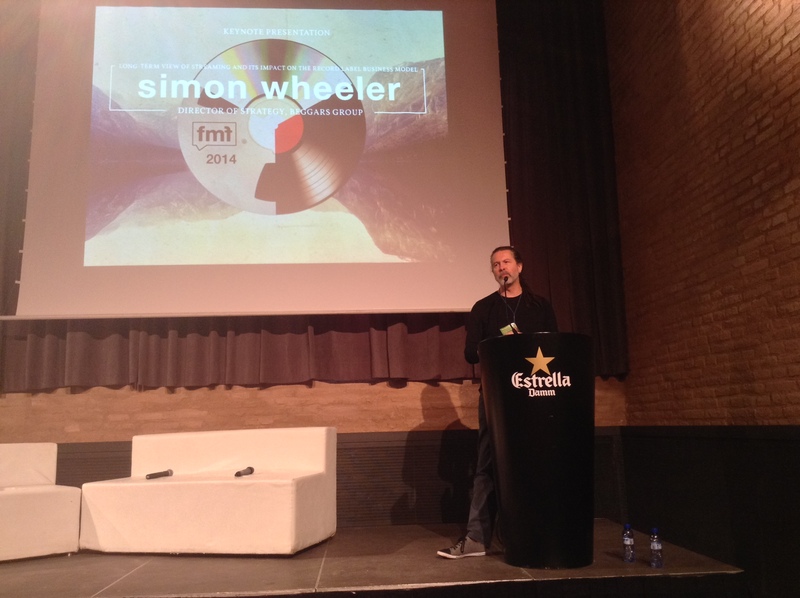 Finally, we would like to highlight Simon Wheeler speech about streaming. Director of Digital Strategy at Beggars Group (record company with mythical labels like Matador Records or Rough Trade Records), he has lived firsthand the crossing of music biz from traditional to digital format, and he states bluntly that “streaming is the most significant thing that happened in music since recording was invented”. This being said, the question is how to get money from it. Again, “superfan” ideal appears (don’t miss our post <<The Curve: from freeloaders into superfans>> to penetrate the concept): in a world were a million streams is not such a big number (but we still recall those times when a million sales was a success), you need to get people really excited about your product, willing to hear once and again the same artist and yearning for everything related to his / her music idol. Also, Wheeler emphasized the importance of premium services, an stimulating hook for a sector of music audience: for instance, high quality services might be very welcome for a sort of music fans willing to pay for it. 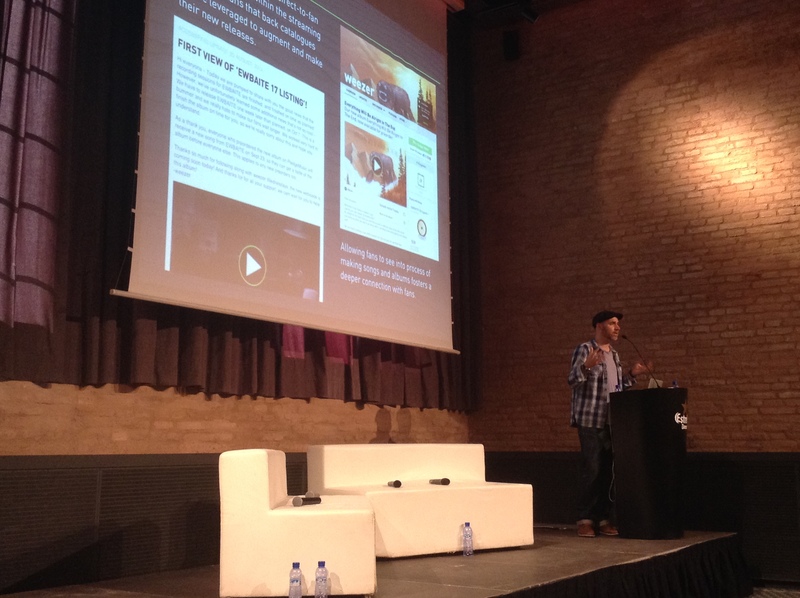 Simon Wheeler talking about streaming at Future Music Forum. Definitely, Future Music Forum gave us a deep insight about new challenges and initiatives for this attractive and complicated industry. Their problems of today are the problems that many other industries will face in the near future, hence their solutions are critical for anyone connected to business in the course of digitalization. In order to keep a readable length for this article, we have not included some interventions also deserving mention, with proposals that we will cover on separate posts. Also, we had the chance of talking with Mark Meharry, founder and CEO at Music Glue, who showed us some eye-opening clues about his solid e-commerce platform for artists. And we had a really interesting conversation with Benji Rogers who, with his warm and clever style, revealed us why PledgeMusic is creating a whole new way of understanding the relationship between artist and audience. We’ll publish both interviews shortly… Stay tuned!